These can spawn in place of any "a Lumbering Beast", so they can appear in the Sleep Walker's cave in the SW corner of the zone, or the canyon that leads from the chamber below Aerin`Dar's platform to the HoHonor zone clicky. This page last modified 2018-02-06 17:18:30. There is a special version called A Lumbering Beast who will update the achievement. You can find him behind Aerin'Dar, he only has one spawn point. Seems to spawn pretty good in the canyon but could never get it to spawn in south west caves. Has anyone gotten one to spawn recently in the sw caves (sleep walker) there's 3 mobs but I have yet to get one to spawn yet. 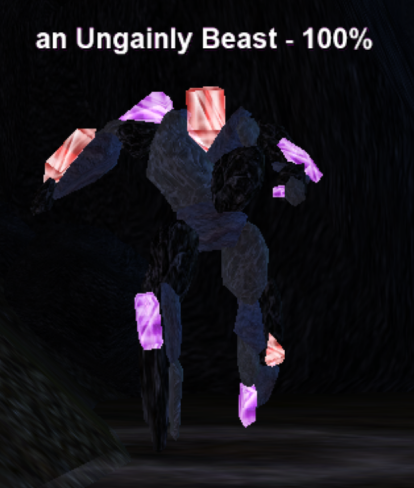 PH for this mob is "a Lumbering Beast", which spawn in the Sleep Walker's cave in the SW corner of the zone, and in the canyon that leads from the chamber below Aerin`Dar's platform to the HoHonor zone clicky. On the basis of spawn count, I recommend clearing the canyon if you're trying to spawn this mob; respawn time on the canyon Lumbering Beasts is 16 minutes.